...willing to go all night! Every once in a while, a book comes along that completely floors me. A book that I know, without a shadow of a doubt, will remain with me forever. Hopeless is one of those books. Colleen Hoover takes on a very dark subject matter childhood sexual abuse with a sensitivity that I admire her for. 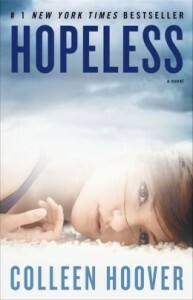 Hopeless is an intricate story with many layers that, as they're revealed, will run you through a myriad of feelings. Sky & Holder. Absolute perfection. I was captivated by them from the beginning; as individuals and as a couple. I want to gush about them, but if I get going, I fear I won't be able to stop and will reveal too much. Suffice it to say, their story is REMARKABLE. Holder belongs on the cover of SWOONALICIOUS! He's deeply protective of Sky, and as the story progresses, as the mysteries are exposed, I fell more and more in love with him. His unwavering support in the face of what Sky discovers solidifies him as one of my all-time favorite book boyfriends ever! And Sky, beautiful girl, her strength and bravery is really something to witness. The true definition of survivor! Don't wait to read this book! Get it now and be ready to devote your time to it because once you start reading YOU WON'T BE ABLE TO PUT IT DOWN!